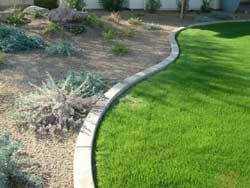 The slant style became popular in the 90’s because it can be stamped and textured or done in regular gray concrete as can the curb style. But, unlike the curb style, it has the unique ability to also hold in gardening materials because the back of the curb is higher than the front. 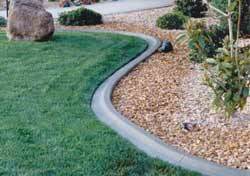 The front side of the curb is generally set at ground level to accommodate lawn mower wheels. The slanted look shows off any texturing or stamping that may be applied. 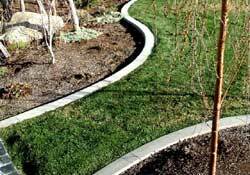 This style is very popular because it is installed to both accommodate a lawn mower wheel and at the same time retain gardening materials because of its higher back side. It also has great curb appeal because it sets off the landscaping with a picture frame type of look. This style can be used like the regular curb style or it can be used as a retainer. The 6X6 is sometimes the spec that is used by commercial architects and it is simply placed deeper in the ground. 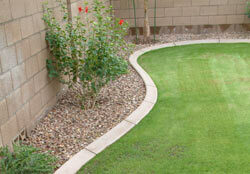 Other applications may include retention of gravel, gardening materials or other driveway or walkway situations.